Why do we start with pitch and notes? Because there is a strong argument that it was where music started, at least historically, in the West. Admittedly, the case could be made for the origins of music in rhythm, though, and I wouldn't want to get into that argument, so we will deal with that next. We have to start somewhere. 1 Some lower ranges, down to 4 Hz, can be felt rather than heard. We do not generally perceive them as notes. Nor are the extremely high ranges so perceived, although both may be part of the ambience of an otherwise musical piece. 2 It is the relative positioning that makes us hear groups of them as a melody. Modern English speaking music culture generally recognizes 440 Hz as the standard a out from which the rest of the notes are measured, but this has not always been true, and is not universally recognized today (The rest of Europe is a little higher, for example). But even if a = 400, as long as the relative relationship of the notes is more or less stable, most people do not notice the difference, and virtually all would still consider it music. See my discussion in the Waveforms and Harmony page. 3 Occasionally, you will see a keyboard with different colors, or with the black and white reversed. It is the layout of the keys, not the colors, that makes it a standard keyboard. The term 'octave' itself implies a further subset from the 12 of seven notes (the eighth, after which the octave is named , is the return to the beginning). Of these, only the octave is mathematically obvious (each time you double or halve the frequency you get to the next octave higher or lower, respectively). Most of the rest are approximations of the overtone series (see the Waveforms and Harmony chapter). Since about the 16th c. we have settled on a semi-even division of the notes between the octaves (by semi-even I mean that it is logarithmic rather than arithmetic, and actually shifts slightly as you moved up the octaves). It is called the Equal Tempered Scale. Other cultures have other divisions, and other senses of what is harmonic, but it is not the purpose of these pages to analyze all music theories worldwide. At the right is a single octave on the piano. You will notice that there are seven notes bearing a single letter (i.e. without ♯ or ♭ signs. They are lettered a–g, although convention has them start on c, go to g, and then start over at a. This is one version of a seven note subset of the full 12 note collection. The black keys are the other five, bringing us to 12. The black keys receive their names relative to the adjacent white keys, 3 so each has two names one from the key to the left (making it x♯), and the other from the key to the right (making it y♭). Of course, the note to the right of the b in this image would be another c.
4 By 'full' piano keyboard, I mean a standard sized piano. Many electric pianos have only 77 keys, and some have less than that. The full piano keyboard has 88 keys=notes4 and has become the range that sets the standard for most western music. We name the octaves in sets from c to b based on the piano range. 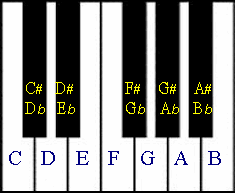 The bottom notes would be a0–b0; the d above middle c is d4, and so forth. The organ can go lower than the piano as well as higher; obviously electronic instruments can produce notes well out of this range—they can keep going in both directions beyond the range of human hearing. Those notes are represented in the same way (sometimes even outside of the human hearing range). There are no sharps and flats, which is why it is all white keys. The major scale is the one you hear most often in Western music, and particularly in modern pop music. The scale steps themselves are numbered. In the case of C major, c can be called 1, but is usually just named the root or the tonic. The 2, or the second, is d, e is 3 or the third, and so forth up to the next c, which is both 8 (the octave) for this scale and the root for the next one. Note that I try to use italics when I use numbers for scale steps. I also try to use lower case for notes and upper case for scales (and chords, on a later page). If you look at the piano again, you should notice something right away. Not all white keys have black keys between them. When there is a black key between the whites, the distance between the two white-key notes is called a whole step. When there is no black key that interval is called a half step. An 'interval' is the distance between any two notes, not just notes that happen to be next to each other. Since the white keys together make up a major scale you can observe that the third and fourth notes are a half step apart, and so are the seventh and eighth (the octave). All others are a whole step apart. In fact, each key (scale based on some tonic) has a different set of sharps or flats (but not both, as we will see) to make its major scale. D has two sharps (f♯ & c♯), A has three (d♯, c♯ & g♯), etc. Do you see a pattern? Each time I added a key, it included all the sharps from the previous key and added one more. In fact, the extra sharp was always on the seventh of the new key. This is a consistent pattern, but the trick is to remember the order in which the keys get added (you probably noticed that they were not alphabetical). That happens to be (starting with 0 sharps) C, G, D, A, E, B, F♯, & C♯. I don't know of a good mnemonic for that; e-mail me if you do, or think of one. There is a nice mnemonic for the order of the sharps as they get added, though: Father Charles Goes Down And Ends Battle. If that does not seem all that cool to you, you may change your mind when we talk about the flat keys, which will be right now. OK, you probably noticed that didn't cover all the keys. Noticeably missing was every guitarist's nightmare key (which, ironically, seems to be every pianist's favorite), E♭. I am sure you thought of several others. So, going in the other direction the order of flat keys is F, B♭, E♭, A♭, D♭, G♭, & C♭. Only F does not have a flat tonic. What makes it a flat key is that it is created by adding one flat to the scale—b becomes b♭. After that they pile up like the sharps, except they add the fourth of the key each time rather than the seventh. So, B♭ has two flats (b♭, & e♭), E♭ flat has three (b♭, e♭, and a♭) and so forth. The order of the flats as they get added has the mnemonic Battle Ends And Down Goes Charles' Father. You probably noticed that this is the last mnemonic backwards. Conveniently, it makes a (sort of) sentence in either direction. As an aside at this point, did you see that when the accidental appears with a letter, it is written after. If it is with a note on a score, it is written before. As we will see later, when notes (or chords) are written as numbers and require accidentals, the accidental usually, as with score notes, precedes the number (although I have seen it both ways). Sometimes people will simply refer to keys by their signatures, calling them six sharps or six flats. The flats and sharps are always written with the same layout. They will obviously start on different lines in different staves, but the first sharp will always be on an f and the first flat will always be on a b. If you need fewer flats or sharps (most of the time), you keep the same layout, but pop them off the end until you have the right number left. It is important to note that keys do not mix up the sharps and flats. Even though an f♯ and a g♭ represent the same key on the keyboard, or the same string/fret on a guitar, we do not mix them in any given key. The reason for this is that this way every key has seven unique letters: a–g (not necessarily in that order). This is a common mistake you find in on-line chord charts (chords work the same way). You can't be playing in the key of A and run into a d♭. The note is present in the key, but it is properly called c♯. The exception occurs when you temporarily move to a foreign key (longer changes require a key signature change). You are playing in the key of A when you get a passing chromatic line like this: a, b♭, b(♮). Since A is a sharp key, that middle note would usually be a♯. But this is not a hard and fast rule. For example, if you are writing a trill between the a and the a♯, that is much easier to read if you use a b♭. Cleanliness trumps clutter, generally. 6 Well, you will have hit every key except C♯ and C♭ which are both redundant keys (=D♭ & B respectively) whose only purpose is to allow you to modulate a fifth/fourth from F♯/G♭. 7 This image is just slightly modified from the version created by Just Plain Bill for Wikipedia. In this diagram, each key (major keys in red) is accompanied by its key signature. I have given you some helps for remembering this, but the bottom line is that you just have to memorize it, including the key signatures. You should know without doing mental calculations that the key of A is three sharps, and that A♭ is four flats, etc. 9 For what it is worth, I do not use the 'lower case = minor' approach, I just stick a lower case 'm' after the letter name to indicate minors. This is at least partly because I am using lower case for notes, as distinct from chords and scales. My approach is more consistent with what you will see in popular music charts. Between chords and scales, you will have to tell by context what is intended. Perhaps you were thinking (but probably not), "What are those green letters on the chart?" Well, that is where we are going next. 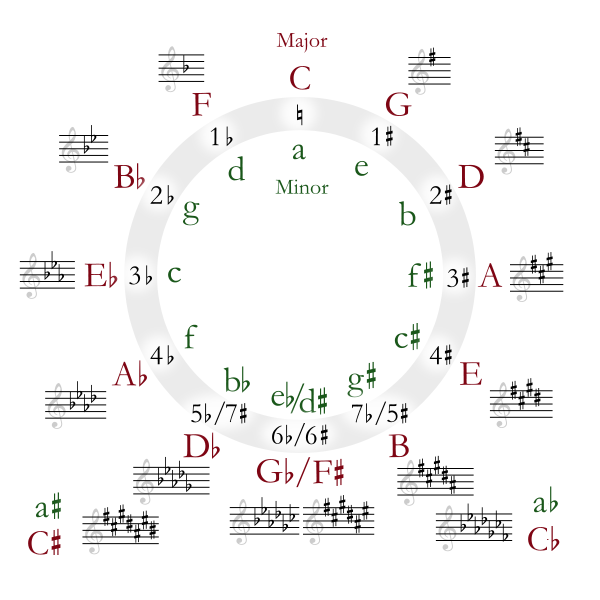 The chart says, they are minor keys; indeed, that they are. There are actually three different minor scales for each key. Of these, the natural minor has exactly the same notes as its relative major.8 So the Am (A minor) scale looks like the next score fragment. 10 Not authentic Oriental (i.e. South or East Asian), but it is the sound that Western composers have used to create that impression among Western listeners. This provides a leading tone, but gives the scale a sort of Oriental feel10 that comes from the fact that you no longer have a smooth transition between the sixth and seventh steps (it now jumps up three half steps, rather than the normal one or two, between notes). Still it works for chords: with this scale you get to play an E (major) chord as part of an Am key. Lady Gaga uses a lot of this in "Bad Romance." Rogers and Hart use this in "My Funny Valentine," as do the Beatles in "Yesterday." All these minor keys, of course, work the same way as the major keys in the sense that distribution of whole and half steps are consistent across keys. 11 Technically, the 'classical period' covers the period from early to mid 18th c. through the early 19th, but popular usage extends it back through the baroque period and up through much of the 20th c.
12 If these all sound like places in and around the Ionian sea (between Greece & Turkey), it is because they are. In fact the 'modes' are talked about a fair amount in classical Greek literature. It is unlikely that those modes had much to do with their medieval namesakes other than that the latter were named after the former. I hope eventually to add a discussion of ancient Greek music, but don't hold your breath. Major and minor are not the only options. Although they dominate the period from the 15th through the 19th centuries, particularly in what we generically call 'classical' music.11 But prior to the Baroque period, other modes were common, and in modern music, both academic and popular composers have been experimenting with other modes. 13 Heinrich Glarean coined the term 'Hyperaeolian' ('above Aeolian') for this scale in his Dodecachordon (1547), and wrote, or commissioned, a couple pieces to demonstrate it, but even then he did not include it in his larger system. You may have noticed that there was one missing. What do you get if you start and end on b using only white keys? The simple reason is that this mode was not used in the medieval period. The root chord is built on a tritone, which was dissonant to their ears.13 The Greeks had used a mode they named 'Locrian,' so in the 19th c. that term was adopted to cover this 'mode.' It has been used occasionally, and sometimes serves as a backbone for modern lead riffs. Like the other modes, it is obviously transposable. The trick with modes is to be able to hear the proper resolution. We are so programmed to hear the majors and minors that the modes often don't feel right. But some, like the Dorian, have undergone a revival in pop. 14 By 'atonal' I mean music that tends to shy away from what most people in the West have come to regard as harmonious: a sort of musical version of the same experimentation that lead to abstract expressionism in the graphic arts. 15 'Diatonic' (lit. through the notes) is a term for music based on the seven note scales I have been talking about, and usually specifically major or minor. Other scales are possible, and I may get around to doing a page on them, but 20th c. academic music (which some people call 'serious' music, others 'modern classical') was often dominated by the chromatic scale. This scale consists of all twelve notes. It is obviously an important part of atonal music,14 but in tonal music chromatic embellishments are still frequently used in and around diatonic15 scales to add interest. Moving in the opposite direction, popular music, lead parts in particular, have a strong tendency to reduce the scale to a five note subset called the pentatonic scale. With some variation this is also called the 'blues scale.' These scales are important enough that I will reserve them for a fuller discussion later. Intervals between notes are categorized in a way similar to the way we described the position of a note in the scale. They are classified by distance. A note that is two scale steps away from some other note (regardless of whether those were half steps or whole) is said to be a third away. When the melody jumps up from the lower of these two notes to the higher we say it has moved up a third, if the other direction that would, sort of obviously, it would be called 'down a third.' The idea is that if you count the first note as one and move through all the scale notes to the second note (counting as you go) you will be on three when you get there. Similarly, if you count scale steps to five, the interval between the first and last notes is said to be a fifth. You quickly discover, though, that not all intervals of the same numeric size sound the same (a to c is a third, but so is a to c♯). Four of the intervals (2nds, 3rds, 6ths, & 7ths) are said to have minor and major versions. In all four cases the relation between minor and major is the same: the major is one half step higher than the minor. As it happens, all but the second correspond to the major and minor keys. A major key contains the major third, sixth and seventh; the minor key contains minor versions of all three. Neither contains a minor second; among the modes, only the Phrygian mode does. In point of fact, using this method, the Phrygian appears to be a more natural minor key than the Aeolian. In these intervals, it is the first two of every three note set that represents the interval in question. The interval between the second and third notes is the inverse, discussed below (under "Interval inversion"). The fourth and fifth are called 'perfect' intervals (there is no minor or major fifth). The note in between them, sometimes called the tritone, is considered either a diminished fifth (5) or an augmented fourth (4). 16 Outside of the equal tempered scale, f♯ & g♭ are not identical. There is a barely audible, but real, difference between the notes in the Pythagorean scale, for example. By the way, the scale steps have names. We have already seen that the root can be called the tonic. Here are the rest. Most modern theoreticians will add leading tone to this list for the major seventh, and will also call the minor seventh the subdominant (also known as the dominant seventh). These are useful terms, and as you know, I have already made use of the term 'leading tone,' but it is not originally part of this system, as the lack of a Latin name may suggest (this distinction in theory dates from the early 20th century). It also upsets the consistency of major-minor inversions discussed two paragraph hence. These terms do not at all contribute to your understanding of music theory, but they are standards in music lingo. If you are not familiar with them, you may be confident that you will be embarrassed at some point. 17 Unless you want to call the octave the inverse of the unison. Every interval in the chromatic scale (and any of the scales we have talked about) has an inverse, with the exception of unison (same note).17 Up a second always gets you to the same note as down a seventh, except that the latter is an octave lower. Up a third is the same note as down a sixth. In both these cases, the major-minor aspect must be reversed. Up a major third, for example, is the same as down a minor sixth. And the reverse is true. This principle holds for seconds and sixths as well. This is, to some extent, reflected in the names in the last table. The mediant inverts the submediant; the supertonic inverts the subtonic, etc. tritone inverts to tritone *(augmented forth inverts to the diminished fifth). See the next paragraph. The two 'perfect' notes, the dominant and the subdominant (fifth and fourth) have the same relationship, without the major/minor qualification. The tritone, like the tonic, always inverts to itself, although I suppose some theoretical purists would insist that the diminished fifth must invert to the augmented fourth (its enharmonic equivalent). Compound intervals are intervals greater than an octave. The relationship to the in-octave intervals we have talked about so far is that you need to add seven to the one to get the other. Using this method, an octave + a second is called a ninth; an octave + a fifth is a twelfth, etc. Do not confuse intervals and scale steps. They are similar concepts, but the first describes the distance between any two notes, while the second describes the function of any given note in the scale. The latter happens to be the same as the distance between the next lower tonic and the note in question, but they are nevertheless fundamentally different concepts. 18 By the way, if you are trying to be able to hear, or sing, intervals, the first two notes of "My Bonnie" are an excellent example of a major sixth—one of the more difficult intervals to just get in your head when you are first starting. Opening line from "My Bonnie lies over the ocean"
This first phrase from the Scottish folk-tune "My Bonnie" illustrates this difference. The numbers along the bottom line are the scale steps. The red letters/numbers are the intervals between notes in the melody.18 I have used upper case 'M' for major and lower case 'm' for minor. This is a common practice that you will see frequently. 19 Right at the beginning of my first semester studying music theory, the instructor asked us, among various other theory related things, to pull out a sheet of music paper and write down the tune to "America the beautiful." It was not that he was a patriot; he just wanted to see how much we were bringing, skill-wise, to the class. After an hour I was still there. He concluded that the three of us that were left must either really know what we were doing, or be totally clueless. I, of course, fell into the latter category. 20 Start with "Frère Jacques" or "Row, Row, Row your boat," then move to something a little more complicated. Do not start with to "America the beautiful." 21 The syllables were originally notes in a familiar hymn (perhaps the Sound of Music's "Do, Re, Mi" serves that function now). The original tonic was ut, but was changed to do in 16th c. Italy so that all syllables would be open. A syllable for the seventh, si, was added at the same time. The change to ti was made in 19th century England (by Sarah Glover) so that each note interval would have a different initial consonant. Solfège was originally accompanied by note shapes and hand signals. One of the best things you can do for yourself is train your ear to hear and identify intervals.19 Take an easy song,20 and without picking it out on your instrument, try to imagine what the intervals are. You will notice I did not say 'notes.' You are welcome to try to develop perfect pitch (the ability to recognize or produce an exact note on demand) if you want, but that is not as important as hearing the relationship between the notes. This is called relative pitch. Once you have it, you will be able to hear a tune in your head and just write it down. No need to go running to your guitar or piano. No need to carry a tape recorder with you everywhere you go so you can embarrass yourself singing into it while you are riding the subway, because that happens to be where you got the tune idea. If you were actually in a college class learning this stuff, I can guarantee you that you would be expected to develop both this, and the next skill. The reason is that the professional musicians who run those classes know how important it is to your musicianship. Along with ear training, you should be learning to sight sing. This internalizes the connection between the written notes and the actual pitches better than much anything else you can do. If you don't read music for your instrument, you should do the same kinds of exercises developing that skill as well. In reality, it can get even more complicated than this, because it has various other names for enharmonic equivalents (there is a separate augmented 4, for example). Minor keys are either simply transposed (the tonic stays as do) or treated as a type of the major so that the tonic is sung as la. The reason people find solfège helpful is that the better way to read to sight sing is not about identifying the relationship between notes and dots, but about learning to recognize the intervals between them, and their place in the current scale. Solfège reinforces this, but it is hardly necessary. If Latin syllables seem weird to you, you could always substitute scale steps. "My bonnie" would be 1,6,5,4,5,4,2,1,6. If you were particularly into it, you could use French (or some other language) for the accidentals. But you don't really need a crutch like this; it's just that some people find it helps. We are not done talking about melody, but we are going to move on for now to the second major component in music, rhythm.